In 1985 new owner Jack Tramiel was ramping up Atari to go head to head with his old company Commodore. He was banking on the new 16-bit ST machines to deal the knockout blow but must have felt there was still sales to be wrung out of the old 8-bit machines. Enter the 130XE. It is essentially a repackaged 800XL the differences being a new case and keyboard, double the RAM at 128k and an Enhanced Cartridge Interface (ECI), which allowed external devices access to the computer's bus and data lines. There were few examples of software ever written to use the extra RAM (although it made a nice RAM disk) and little hardware was made to use the ECI. In reality then, it offered little more than the 800XL delivered. Given that Atari's focus was now squarely on its 16 bit range it was no surprise then that this machine languished somewhat and it was never a big seller. Why do I have one in my collection? Although not what I'd consider "a classic" it does represent the closing chapter in a venerable line of 8-bit machines from Atari. Besides, it was donated at no cost and is in good working order. I had to let it stay! My impressions? It's attractive enough but not as nice to use as the 800XL. It seems cheaper somehow. The keyboard is "mushy" and the case is lighter and feels flimsier. However, it does run all those cool 8-bit Atari programs! This gifted unit was used primarily as a word processor hence I've decided to display it as such. What you see is what came with the machine. 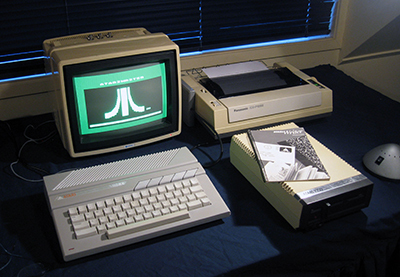 A monochrome screen, disk drive, Atari Write cartridge and a Panasonic KX-P1080 dot matrix printer. Actually in New Zealand the printer is more of a classic than the computer! A HUGE number of these Panasonic models were sold, and they were probably one of the most common low-cost printers on the market for a while. I had one for my System 80. The case and keyboard on this was somewhat sun-yellowed on arrival. That was fixed with a little restoration work over the 2008-2009 New Zealand summer.